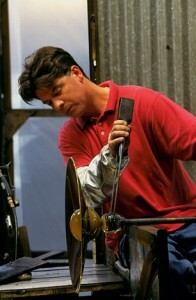 Ben Moore began his long and intimate involvement with the world of glass by earning his B.F.A. in ceramics from the College of Arts and Crafts in Oakland, California, and his M.F.A. from the Rhode Island School of Design. 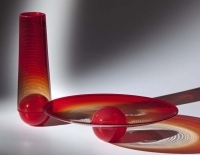 He has been a designer for the Vernini Studio in Murano, Italy, on the faculty of the Massachusetts College of Art in Boston, Massachusetts, and served as both a faculty member and Trustee Board Member at the Pilchuck Glass School. Moore’s love and appreciation for classical technique and design are apparent in his “Interior Fold,” “Exterior Fold,” and “Palla” series, all of which utilize elegantly traditional methods of decorative form. His work can be found worldwide in collections in Bavaria, Denmark, Austria, and Japan, as well as in the Venini Collection in Murano, Italy and in such American collections as the Corning Museum of Glass, Corning, New York, the American Craft Museum, New York, and the High Museum of Art in Atlanta, Georgia.